This exploration of the rock record of Earth Time has focused largely on the initial nineteenth-century division and grouping of strata. The 'brotherhood of the hammer' were highly territorial and ambitious as they hustled and bustled amongst the rocks and argued about how to carve up Earth Time. They hoped to promote themselves and secure lasting personal reputations by establishing their 'systems' as nationally and internationally recognised divisions of Earth Time. Like Charles Dickens's Mr Gradgrind they believed in facts rather than theories. But one of the major problems of geology as a science is that the interpretation of the seemingly 'rock-solid facts' can actually be highly variable. Disputes were and still are the name of the game and ranged from minor spats to long-running, bitter and highly personalised feuds between the protagonists. Whoever said that science was impersonal? This historical carve-up used obvious differences between sequences of rock types and their fossils. The overall result was a piecemeal scheme of division, cobbled together over a considerable period of time by many different authors in various parts of the world who were making up the rules of the 'game' as they went along. By the end of the nineteenth century Earth Time was divided into five major 'eras': the Quaternary, which included the recent ice ages and present or Holocene time, the Tertiary (also known as the Cenozoic) or 'age of mammals', the Mesozoic or 'age of reptiles', the Palaeozoic, which included the 'ages of amphibians, fishes and primitive life' as well as the beginnings of life. Finally there was the Precambrian or Azoic, which was thought to be devoid of life. Within these major divisions, a chronological sequence of systems was defined such as the Silurian and Devonian, based on distinctive and often regionally located successions of strata, with characteristic fossils. It was the actual rock and its varied content, including fossils, which provided the material basis that geologists were trying to place within the abstract continuum of Earth Time. The fossils often represent particular episodes in the history of life. For example, the Devonian was thought to preserve the early development of the fishes and the Jurassic to preserve part of the dinosaur story along with that of their aquatic and flying relatives. Paradoxically, however, the Jurassic strata of the Jura Mountains, by which the period was first recognised, are mostly marine and do not contain many fossils of the terrestrial dinosaurs. There was an inherent duality in the scheme. Although the chronology of Earth Time is essentially a continuum, it was recorded and represented by 'unit' sequences of rock strata (the study of which is called chronostratigraphy). It gradually became clear to geologists that the boundaries of successive units often represent gaps in the record of deposition. And when the matching of unit boundaries was attempted on a regional or global scale, it was evident that they were not necessarily synchronous and often overlap. The business of sorting out such discrepancies was and still is highly contentious as contenders vie with one another to promote the claims of their favoured stratigraphic successions. It became quite clear why such problems were arising. At any one time, contemporary deposits are laid down in any number of different sedimentary environments around the world, ranging from desert sands to glacial moraine and tropical reef carbonates. The boundaries between different environments of deposition shift over time as for instance deserts, ice sheets or seas expand or shrink with continuous climate change and the movement of the continents and oceans. Although the major divisions of Earth Time were established by the end of the nineteenth century, geologists had to spend the next hundred years and more trying to make the scheme more workable and sort out its inherent contradictions. Even by 1881 when the second International Geological Congress met in Bologna, everyone acknowledged that some sort of international agreement was necessary so that geologists around the world use the same divisional names for Earth Time in a consistent way. For example, any reference to the base of the Devonian System of strata and the beginning of the Devonian Period of Earth Time is now 'based' on a fixed point in a continuous sequence of fossiliferous seabed sedimentary strata. Despite the fact that the Devonian System is so named after the county of Devon in southwest England, it was discovered that the sequence of strata from the top of the Silurian System is not present in Devon. Consequently, the base of the Devonian ended up located within an equally historic region, namely Joachim Barrande's Bohemia. It took the best part of 100 years before the Bologna initiative became a practicality. Eventually, in 1972 the first internationally agreed system boundary to be formally marked was that of the Siluro-Devonian. The specific locality is the euphonically named Klonk section near the village of Suchomasty in the Czech Republic. Ceremonially marked with a 'golden spike' in 1972, the specific point is bed 20 in the section where fossil graptolites of the species Monograptus uniformis first appear in the strata. Just above this, limestone bed 21 contains trilobites belonging to the Warburgella rugulosa group, which are indicative of the Lochkovian stage, the earliest stage of the Devonian Period. The idea is that such points should be fixed in perpetuity but there are arguments that the scheme should not be over-rigid. The base of the Devonian also demarcates the top of the Silurian System, but the base of the Silurian System has been formally marked with a golden spike at Dob's Linn in southern Scotland. Here the boundary is marked by the first appearance of the graptolite species Parakidograptus acuminatus and Akidograptus ascensus in a continuous succession of marine strata from the underlying Ordovician. It might seem slightly strange that the top and bottom of a system of strata are placed in different countries, but the passage of Earth Time is a global phenomenon. The purpose of a golden spike is to locate and define a level in a section where time and rock coincide. Earth Time have been selected along with other important subdivisions such as epochs. But most important are the 90 or so stage divisions, the smallest and most fundamental units of formal Earth Time classification, 50 of which have been formally located so far (there were only 15 designated in 1990). Stages represent all rocks laid down during the time span assigned to that stage and are the only units to be represented by carefully selected type sections. Essentially golden spikes mark the lower boundaries of stages and some also coincide with epoch and period boundaries. For instance, the golden spike at Dob's Linn, near Moffat in Scotland, placed 1.6 m above the base of the Birkhill Shale, not only marks the base of the Rhuddanian Stage and the Llandovery Epoch but also the base of the Silurian Period. The reason that the base of the Cretaceous Period has yet to be defined is that its basal stage, the Berriasian, has yet to have its lower boundary marked by a golden spike. Since 1994 when the International Stratigraphic Guide was published, the specific geographical and geological rock contexts of stage boundaries within type sections have been referred to as Global Boundary Stratotype Sections and Points or more conveniently GSSPs. A breakdown of the locations on a national basis shows an interesting distribution that reflects a mixture of historical influences and geological/geographical considerations. The present geographical distribution of GSSPs is as follows: Australia 1, Canada 2, China 4, Czech Republic 3, Egypt 1, France 4, Germany 2, Italy 7, Morocco 1, Portugal 1, Spain 1, Sweden 2, Tunisia 1, UK 9, USA 5. Apart from their geological appropriateness, the GSSPs also have to be readily accessible to scientists and their immediate environments have to be secure from deterioration, damage or change in land use. Most importantly, the grand hierarchical scheme of Earth Time subdivision has been tied into the radiometric scale with increasing accuracy since the pioneering work of Arthur Holmes in the late 1930s. But the problems of matching ages, based largely on radioisotopes generated within igneous rocks, to the sedimentary strata-based divisions of Earth Time ensure that this process will continue for some years. In 1937 Holmes estimated that the base of the Cambrian system of strata and thus Cambrian time began around 470 million years ago. By 1959 his estimate had grown to 600 ± 20 million years, whereafter it has come back to 542 ±1.0 million years ago. And Murchison's Silurian System, which at its apogee subsumed the Cambrian and included all strata from the base of the Devonian down to the top of the Precambrian, is now estimated to have had a duration of around a mere 27 million years from 443.7-416.0 million years ago to become one of the shortest periods of Earth Time. Some boundaries are more securely dated than others so that the present chronology is still not finally set in 'tablets of stone'. The analytical errors associated with the otherwise precise dates for the Cenozoic, Mesozoic and Palaeozoic eras are 65.5 ± 0.3,251.0 ±0.4 and 541 ±1.0 million years respectively. There are also direct dates on the base of the Carboniferous, Permian, Jurassic and Oligocene. But most other period or stage boundaries lack direct age control and so are based on interpolation between known dates and high-resolution biostratigraphic zonal schemes. The ages for this large group of Earth Time divisions are most likely to change over the next decades. From uppermost Cambrian through to end Silurian times composite graptolite biozones were scaled with links to high-precision zircon and sanidine radiometric dates. The Carboniferous through to Permian is scaled from biozones based on conodonts, ammonoids and unicell fusulinids calibrated against a combination of U-Pb and 4oAr~39Ar radiometric dates. Paleozoic but will be better known with future field investigation. Importantly, the geological record of reversals can help link marine and continental successions. Radiometric dating of many reversals provides an important calibration for the scale and identification of specific reversals within the stratigraphic record and can help date parts of the record that otherwise have no directly available radiometric ages. For instance, the identification of the Olduvai phase of normal polarity between 1.95 and 1.77 million years ago, within the Matuyama reversal from 2.58 to 0.78 million years ago, has helped locate the Pliocene/Pleistocene boundary (at 1.81 million years ago) and date important hominid-bearing African sedimentary strata. The idea that the periodicity of sediment cycles is astronomically tuned might seem far fetched, but it has become yet another chronometric tool that can be tied to the palaeomagnetic and radiometric timescales. Periodic changes in the Earth's orbit and precession cycle can be linked to climate change, especially relating to periodicity within ice ages. The idea dates back to the end of the nineteenth century and the Scottish James Croll, but its modern development originates with the brilliant Serbian astronomer Milutin Milankovich. Although the interaction of the different cycles is very complex, their impact can now be identified in the sedimentary record. For sediments deposited over the last 20 million years or so they are generally regarded as being accurate to within the duration of a precession cycle, i.e. about 20,000 years. James Croll, 1821-90, self-taught Scottish scientist and Fellow of the Royal Society (1876), who after working as a carpenter, shopkeeper and salesman became janitor in Glasgow's Andersonian College where he developed his interest in climate change relating to the ice ages. He was employed by the Geological Survey of Scotland (1867-80) and correlated changes in the Earth's orbital eccentricity with the ice ages and attempted to link them to estimated variations in seasonal solar radiation in the two hemispheres. His influential textbook Climate and Time was published in 1875. Milutin Milankovich, 1879-1958, Serbian astronomer, trained in Vienna before moving to Belgrade University where he, like Croll, recognised that periodic fluctuations in solar heat resulting from eccentricities in the Earth's orbit, tilt of the axis of rotation and precessional change influence whether the northern or southern hemisphere receives more radiation over a 20,000-year cycle. He also linked these astronomical cycles to the periodicity of the Quaternary ice ages. its study, a subject long known as stratigraphy but previously confined to sedimentary strata. In addition, it is now possible to consider the abandonment of the old and rather confusing dual scheme of nomenclature. The time unit terms such as period and system for rock units can be quietly dropped, but whether this will actually happen is another matter. At present, the 90 or so stage-level divisions of the Phanerozoic Eon encompass all Cambrian and younger strata and thus span 542 million years. So on average each stage is some 6 million years long. This represents a remarkable degree of refinement and precision. Within most stages the temporal distribution of particular fossil groups such as graptolites, trilobites, ammonites and unicell foraminifers has allowed the recognition of even finer subdivisions called biozones based on evolving species. We now know, thanks to the framework of radiometric dating, that many of these biozones had durations of a million years or less. Again, this is an astonishing level of refinement that has only been achieved by the painstaking researches of countless earth scientists all over the world. While this approach to the division of Earth Time is very effective for Cambrian and younger strata, it does not work for most of the Precambrian because of the lack of recoverable or stratigraphically useful fossils. Consequently, a different kind of boundary stratotype has to be used, called the Global Standard Stratigraphic Age (GSSA). This is an abstract concept based on boundaries defined purely by linear age, so that the Archean is divided into four eras - Neo-, Meso-, Paleo- and Eoarchean. 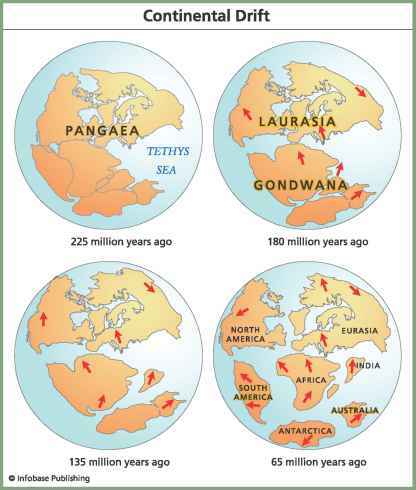 The three younger eras have bases defined by the following ages: 2800, 3200 and 3600 million years respectively. The base of the oldest has yet to be defined because it requires agreement about what developmental stage should be selected within the early formation of the Earth and when that happened - should it be taken from when the first mineral materials have survived? It also has to be remembered that when dealing with radiometric dates derived from rocks that are billions of years old there are significant error bars on each measure that amount to 10 million years or more. However, the youngest Neoproterozoic Era (one of three divisions of the Proterozoic) includes as its youngest system the Ediacaran with a base dated at 630 million years ago. This has a GSSP located at the base of the Marinoan cap carbonate in the Enorama Section of the Flinders Ranges, South Australia. So here the boundary has been selected on an event basis, namely the end of the Marinoan glaciation. There is hope that eventually these Precambrian GSSAs can be replaced by GSSPs as the stratigraphy of this huge chunk of Earth Time becomes better understood. As we have seen, a constant problem with the understanding of Earth Time, the timing, duration and rates of its processes, is the thorny question of the resolution of dates and the estimation of uncertainties related to them. In recent years, much of the debate over mass extinction events and their causes has focused on the difficulty of recognising 'instantaneous' or even short-term events in the geological record. For instance, around 55 million years ago the end of Palaeocene times and the boundary with the overlying Eocene was marked by an extinction event. There was a significant turnover in the newly emerging land mammals and ocean-dwelling micro-organisms. The rock strata from both land and sea environments of deposition record anomalous carbon isotope values across the boundary. Although the anomaly is only measured in a few parts per thousand, nevertheless it was a global event and must represent a release of somewhere between 1200 and 2000 gigatonnes of carbon into the atmosphere. The nature of the event and its global distribution suggested that at least its initiation was probably 'instantaneous'; the question was how long did it last? Analysis of sediment cores from the deep ocean floor revealed cycles of deposition that can be linked to 19,000- and 23,000-year astronomical precession cycles. By relating the cycles to the carbon 'excursion' (or 'spike', as it is called), it became clear that the spike happened over a very short period of time (geologically speaking). Recent research suggests that this large-scale event happened in a rapid single pulse that lasted no more than a few thousand years - a truly catastrophic event by anyone's standard. Such a conclusion can only be reached thanks to an accurate timescale. It then took another 120,000 years for the global carbon cycle to recover. The carbon excursion coincides with climate and faunal changes and has been linked to massive releases of methane hydrate into ocean waters from deep within ocean floor sediments (at least 300 m deep) where it is stored in a solid crystalline state. An estimated 14,000 gigatonnes of carbon are still locked up as hydrate in ocean floor sediments and, if quickly released, would have a severe impact on today's carbon reservoir of 42,000 tonnes. While such resolution of Earth Time is remarkable for the 'deep' past, it is inadequate for the more recent past where dating can still be a real headache for scientists. The recent discovery of the extraordinary 'dwarfed' human species Homo floresiensis in Indonesia is a good example. The skeletal remains were found in cave deposits, which are often notoriously difficult to date accurately by any method. Samples of charcoal associated with the bones have been radiocarbon dated at around 18,000 years ago and other dating measures on the surrounding sediment indicate an age of around 38,000 years ago. Fossil remains of the extinct and also dwarfed elephant relative Stegodon are associated with the human-related bones. And independent evidence shows that Stegodon died out about 12,000 years ago. Consequently, all that can be said so far is that the little Homo floresiensis people lived from before 38,000 years ago to at least 18,000 years ago. Over the last 200 years, much has been achieved in the building of the outlines of the Earth Time calendar and much more will be achieved. But it is important to remember that the construct of Earth Time and its divisions have been fabricated by humans. Uniquely, as far as we know, we are the only life forms to care about the past, whether it is the historic or prehistoric past of Earth Time. Our investigation of the past seems to be part of our continuing effort to understand ourselves and where we have come from. Our forebears felt the strong pull of the deep past and could not resist the temptation to investigate. The new science of geology provided them with the tools and methods to make the journey, however difficult it proved. The revelations of the antiquity of Earth Time and life are fascinating but often prove very uncomfortable for some. The terra incognita of the depths of pre-Cambrian Earth Time, some 4 billion years' worth, are still largely unknown and present a wonderful challenge for future generations of those prepared to voyage into the remotest regions of Earth Time. Fortunately, unlike so many of the pioneers, you no longer have to be a wealthy gentleman amateur or clergyman to pursue the investigation of Earth Time - the future challenge is open to all. Good hunting. Summaries of ratified GSSPs with locality maps and sections are to be found on the International Commission on Stratigraphy's (ICS's) website (http:// www.stratigraphy.org). Details of the state of play with regard to the Quaternary and its subdivision can be found through the website of the International Union for Quaternary Research (INQUA) Stratigraphy and Chronology Commission (SACCOM; http://www.inqua.tcd.ie) and that of the Quaternary Palaeo-environments Group, Godwin Institute for Quaternary Research, University of Cambridge, UK (http://www-qpg.geog.cam.ac.uk).